Whether your patients are suffering from acute or chronic pain, craniosacral therapy can help. Craniosacral therapy uses very light pressure to detect restrictions and restore balance to the craniosacral system. The craniosacral system is made up of the dural membrane that covers the brain & spinal cord and the cerebrospinal fluid contained inside. It has been described as the deepest layer of the fascia. Like fascia, restrictions in the craniosacral system can cause pain and dysfunction and compromise the performance of the musculoskeletal and neurological systems surrounding it. Craniosacral therapy is an effective treatment modality for head, neck & back pain, including post-concussion syndrome, migraines & headaches, acute & chronic neck & back pain, sacroiliac joint dysfunction and much more. This course provides the participant with a background for further craniosacral training. Participants are instructed on techniques that provide effective treatment modality for head, neck & back pain, including post-concussion syndrome, migraines & headaches, acute & chronic neck & back pain, sacroiliac joint dysfunction and much more to incorporate into their massage sessions or use them separately. This Seminar-On-Demand is 2 contact hours in length (check your state’s approval status in the state specific course catalog for your profession). This continuing education course is intended to instruct the professional through a self-paced study on craniosacral therapy techniques for the neck. Identify the anatomy & physiology of the craniosacral system. List the benefits, indications and contraindications of craniosacral therapy. Recognize the assessment process for restrictions in the craniosacral system. Identify the basic craniosacral techniques for the treatment of the back & neck. Identify the basic craniosacral techniques for the treatment of the head; including headaches, migraines, temporomandibular joint (TMJ), and tinnitus. Target Audience: Occupational Therapists, Occupational Therapist Assistants, Physical Therapists, Physical Therapist Assistants, Massage Therapists and Athletic Trainers. A graduate of the Muscular Therapy Institute, Kate Peck has been in private practice for 11 years. She specializes in therapeutic massage, orthopedic massage, myofascial release, craniosacral therapy and somatoemotional release. In addition to seeing clients in the office, Kate does home visits for the elderly and disabled. She also provides massage and craniosacral therapy for brain injured patients at Spaulding Rehabilitation Hospital in Boston. Kate has provided massage services to such events as the Boston Marathon, the Gravity Games, Pan Mass Challenge and the Cirque du Soleil. Kate has been a Nationally Certified and Licensed Athletic Trainer for 27 years, providing sports medicine services to high school, college, semi-professional and olympic athletes. She spent 10 years on the sports medicine staff at Harvard University and has provided sports medicine coverage at the Olympic Training Center in Lake Placid and for the ESPN X-Games. 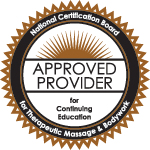 She has been teaching continuing education courses in craniosacral therapy and myofascial release to massage therapists and certified athletic trainers for The Bodywork Education Project. She has also taught both Anatomy and Myofascial Work at MTI/Cortiva since 1999 and enjoys speaking at athletic training conferences and teaching athletic trainers about massage and myofascial release in the treatment of athletic injuries.